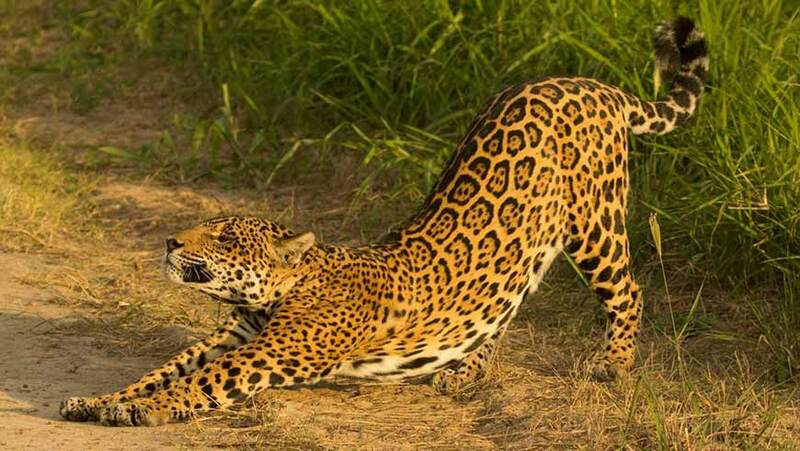 The jaguar is the largest cat of the Americas. Due to excessive hunting and habitat loss, the jaguar population is declining and since 2008, it has been classified by IUCN as Near Threatened. World Wildife Day was first observed in 2014, as a way to celebrate the many beautiful and varied forms of life in our planet and bring awareness to the ever-growing loss of biodiversity caused by human activities. This year the theme is “Big Cats: Predators under Threat” and aims to raise awareness and call for action on the importance of these majestic species. Big cats are under severe threat of extinction due to poaching, habitat loss, human wildlife conflict, and climate change impacts. As of today, the world has lost over 90% of its tigers and 40% of its lions. To protect jaguars and their habitats, the GEF Small Grants Programme (SGP) has supported more than 17 projects in 9 countries. To help conserve Big Cats, SGP also actively supports snow leopard, tiger, and other big cat conservation projects. The jaguar (Panthera onca) is the largest cat of the Americas. Its historical habitat range was from the southwest of the United States all the way to Argentina. However, the jaguar no longer prowls in its northern range, having been virtually eradicated in those areas and its remaining habitat range is badly fragmented due to deforestation, agricultural intensification, and habitat loss. Perceived as a direct threat to livestock, jaguars often end up in human-wildlife conflicts and have been hunted excessively. Since 2008, the jaguar has been classified by IUCN as Near Threatened. The Kaa Iya National Park is located in the Gran Chaco reon, a hot, semi-arid landscape in south-eastern Bolivia. The park covers approximately 3.5 million hectares and is the biggest national park in the country. The Kaa Iya National Park is the best-preserved relict of the South American Chaco forest, its rich in flora and fauna, home to several endemic species and the habitat of a large population of jaguars. Given its size, it is also one of the best areas for observing South America’s large mammals. To protect the rich biodiversity in the park, in 2013, the GEF SGP supported Community Advance Association in partnership with the Traces Association (Asociación Huellas) to establish a community ecotourism initiative focused on guided wildlife observation in northern Kaa Iya National Park. One of the main attractions of the park is the healthy jaguar population estimated to count at least 1,000 individuals, which is monitored by camera traps. In 2016 alone, 83% of the tourists who visited the park reported having observed jaguars. The project itself is named "Kayana: the Spirit of the Forest," after the park’s star, Kayana, a well-known and frequently photographed jaguar in the project area. Jaguar observation generates important environmental and economic benefits to the community, whose local population now values ​​the jaguar as the main element of their tourism product. With support from GEF SGP, the community received technical assistance and improved its capacities on ecotourism management. As a result, local community members are represented on and participate in the Kaa Iya National Park Management Committee. Their active involvement in the park’s day to day operations and first-hand experience of the value that ecotourism can bring, has enhanced their sense of ownership, increased their interest in preserving the biodiversity of the area and reduced the pressure on their immediate environment by using ecotourism as their main source of livelihood. In Kaa Iya, active community participation in the Management Committee and in the development and implementation of the PA management plan has been essential in strengthening an environmental governance structure that meets the needs of both the community and the local wildlife, for sustainable livelihoods and landscape resilience. This has contributed to the construction of a solid, regional vision for the maintenance of the ecological, hydrological, and cultural landscape, which also underpin the management of Kaa Iya National Park. In line with the objectives of the UN Convention on Biological Diversity (CBD), the GEF SGP has supported thousands of community projects conserving wild species and their habitats across the world. SGP experience shows that increased awareness and participation in environmental governance by the local population are key for biodiversity conservation and the long-term integrity of a protected area. As such, SGP continues to engage with local communities to offer technical and financial support, encourage ownership, and increased participation of communities in environmental and sustainable resource management. The involvement of communities in shared governance and decision-making for vulnerable and protected areas is key to successful conservation.